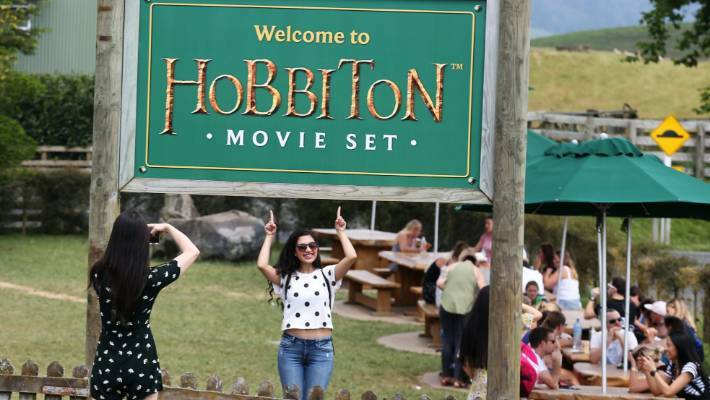 Hobbiton wants to attract up to one million visitors a year. However, in spite of the growing calls from many local authorities and ordinary Kiwis for limits on the number of visitors who come here every year, to line the wallets of a few and degrade the environment for everyone else, the tourism industry has pushed on with unsustainable expansion plans in many parts of the country. It is our only industry which has privatised the profits and nationalised the costs of operations which impose a significant financial burden on uninvolved ratepayers. Now the people of Matamata have finally had enough of unmitigated tourism and want the Matamata-Piako District Council to put the brakes on visitor numbers to the nearby Lord of the Rings film site. The request is a response to an application by Hobbiton for consent to increase to 3500 visitors per day for their movie set tours. The company also wants to set up overnight accommodation and host up to 12 outdoor movie screenings and six loud music events per year. The New Zealand Transport Agency has also warned that if visitor numbers exceed the expected 650,000 per year, then the predicted traffic movements of 387,000 per year will also be exceeded and the agency was concerned that safety at the State Highway 29-Hopkins Road intersection and State Highway 27-Firth Street intersection would be compromised. The agency was also concerned that the only performance standard that could control visitor numbers, was the proposed cap of 3500 visitors per day during movie set tour hours; however 3500 visitors per day equates to more than a million visitors a year. The site has become popular since its opening in 2002, put Matamata near the top of the tourist trail and created jobs. The popularity of the site has, however, also put significant pressure on local roads and other infrastructure. It was inevitable the residents' patience would run out with hordes of tourists wandering their properties and some even using the roadside as a toilet. In reality the district council probably does not have the statutory authority to apply any effective constraints on tourism even if the will to do so existed, and it probably doesn't. There was enthusiasm from locals when the movies were being made and support for a tourism venture when the filming was concluded. Nobody saw the size of the parasitic monster lurking in the background which the film makers would leave behind. Those who have seen the sad transformation of Queenstown in the past three or four decades however will understand the concerns of the people of Matamata. At the height of the tourism season the once tranquil lakeside township is like London city on a bank holiday or Manhattan the night before Christmas. Crowds thicker than the audience at Eden Park to watch a series decider test between the All Blacks and the Springboks leave little room to move, prices are through the roof and finding a vacant parking space within walking distance of the destination is like finding a lost golf ball on a ski field. The good thing about Queenstown is that it is in the middle of nowhere and out of sight. We don't have to go there and most of us don't. Matamata is a different issue as ordinary people live there, they don't like endless crowds of visitors and they should not have to tolerate that imposition. The tourism industry claims that profit from tourism trickles down to the rest of the community and that the industry is self-regulating. That trickle dries up long before it reaches the bottom of the heap where the people live and no exploitative industry has ever been successful at self-regulation. They will also claim that tourism creates jobs and it does but most are at the extreme low end of the scale and marginally above the unemployment benefit. There is also an assumption that the required infrastructure will be provided by tax payers or ratepayers, who are in fact the same people. Any additional infrastructure required by the tourism industry should be paid for by that industry not the rest of the community who already make a significant contribution in loss of the quiet enjoyment of their countryside. Government and the tourism industry have known for some time that communities like Matamata are designed and managed for the people who actually live there. These communities don't see unlimited numbers of tourists in a positive light. They have to clean after them, dodge them on the roads and tolerate their poor behaviour. With local body elections later this year those who want reasonable limits on tourism have the opportunity to elect candidates brave enough to apply some long overdue constraints on the industry.